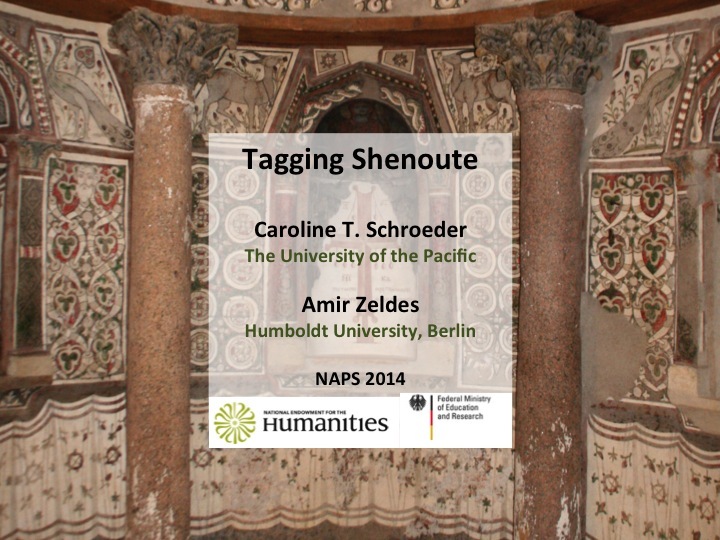 We’ll be presenting at DH2014 in Lausanne, Switzerland, on July 10, 2014. 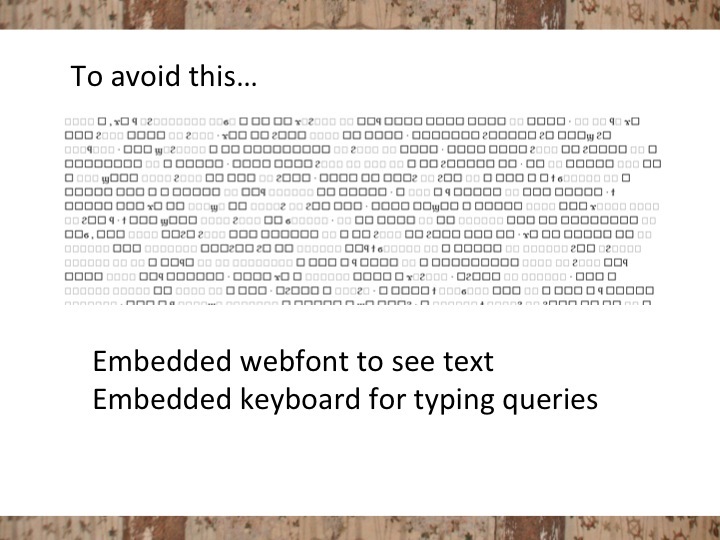 The abstract is below (and at the DH2014 site). 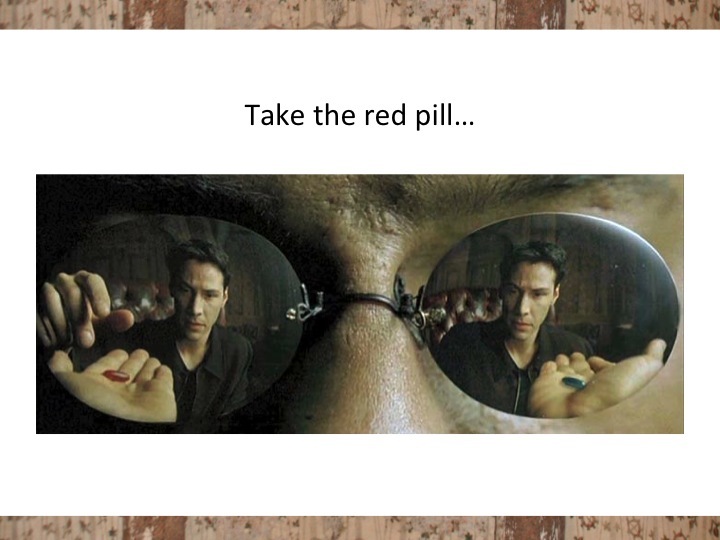 You can also download them as a pdf. 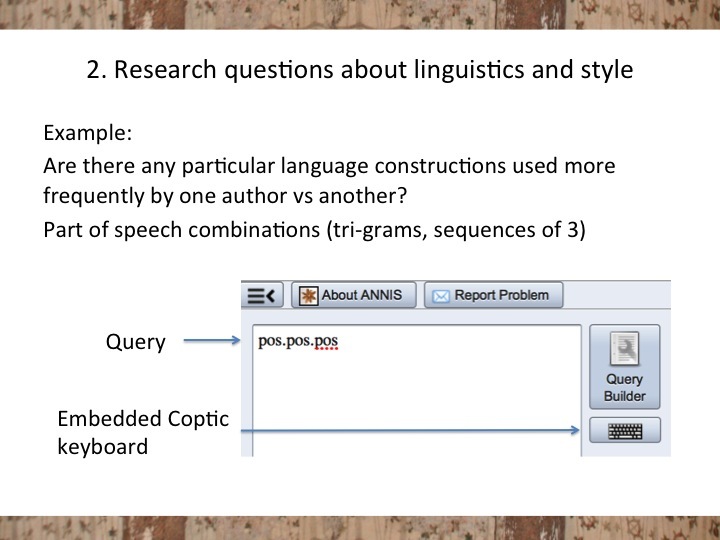 This paper will explain the unique challenges to processing and annotating the Coptic language for digital research and present solutions and methodologies for digital linguistic and historical scholarship. The Coptic language evolved from the language of the hieroglyphs of the pharaonic era and represents the last phase of the Egyptian language. 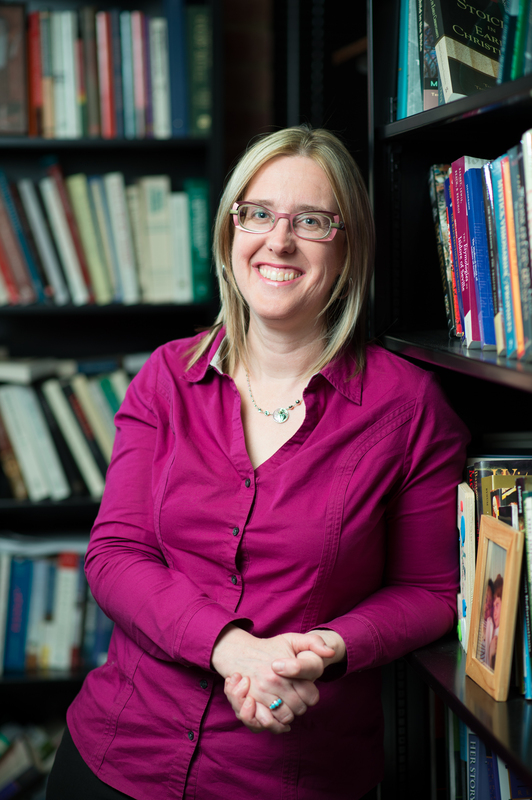 It is pivotal for a wide range of humanistic disciplines, such as linguistics, biblical studies, the history of Christianity, Egyptology, and ancient history. 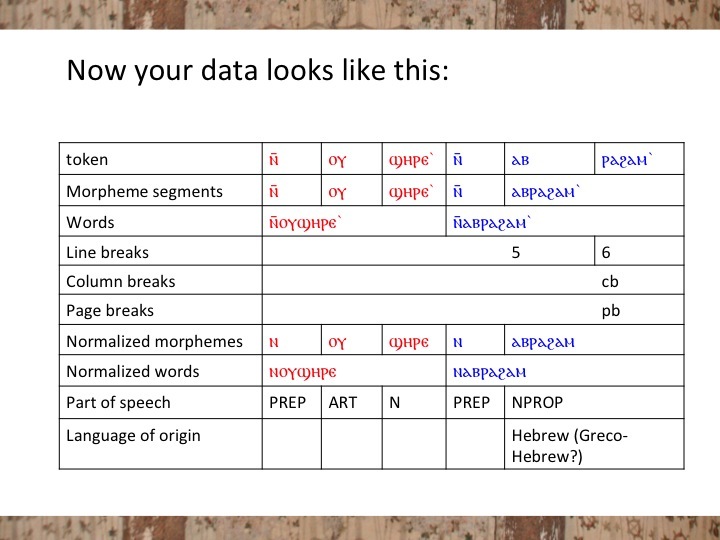 Whereas languages like Classical Greek and Latin have enjoyed advances made in digital humanities with fully-fledged online research environments accessible to students and scholars (such as the Perseus Digital Library), until recently, no computational tools for Coptic have existed. Nor has an open digital research corpus been available. The research team developing Coptic SCRIPTORIUM (Sahidic Corpus Research: Internet Platform for Interdisciplinary multilayerMethods) is developing and providing open-source technologies and methodologies for interdisciplinary research across multiple disciplines in the Coptic language. 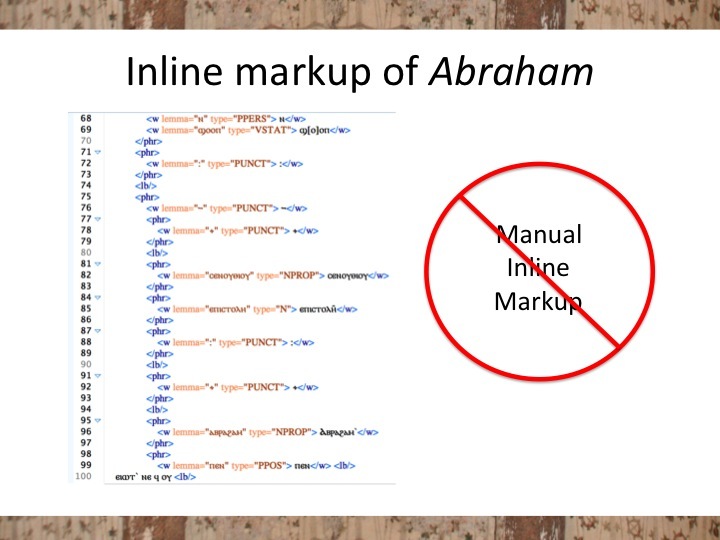 This paper will address the automated tools we are developing for annotating and conducting research on a Coptic digital corpus. 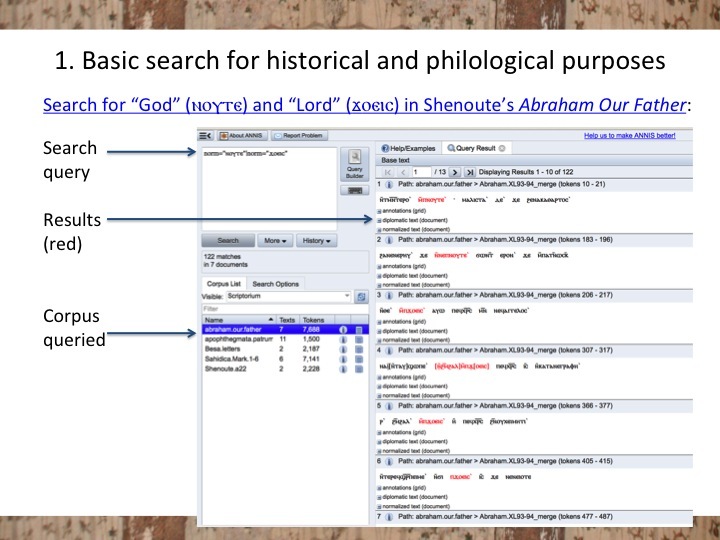 Conducting digitally-assisted and computational research in Coptic using available DH resources is complex for several reasons. Most texts are preserved from damaged, incomplete, and dismembered manuscripts or papyri. 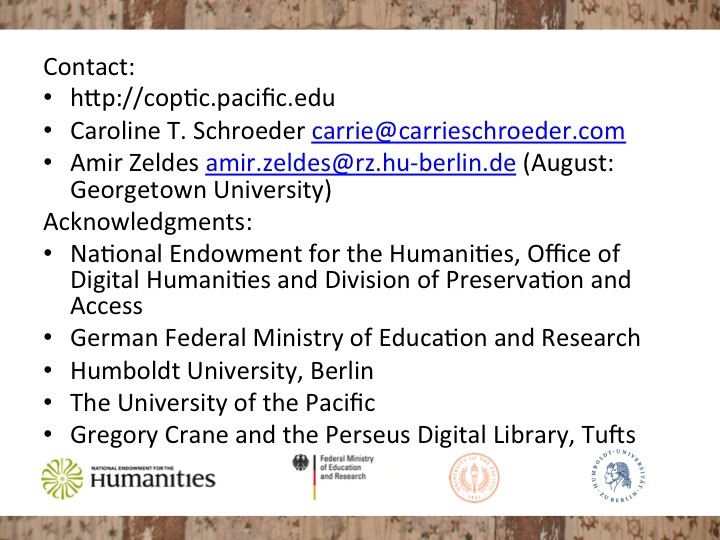 The DH project papyri.info has begun to create an online open-access resource for the study of Greek papyri and is beginning to digitize Coptic papyri and ostraca (ancient pot-shards with writing). These texts, however, are primarily documentary, consisting of wills, contracts, personal letters, etc. Coptic literary and monastic texts, the core of Coptic SCRIPTORIUM, are essential for the study of the Bible, intellectual history, literary history, and religious history. The manuscripts containing these texts were removed from Egypt in the seventeenth through nineteenth centuries piece by piece (sometimes page by page). Some have been published, many have not, and very few have been digitized in a format suitable for digital and computational work. 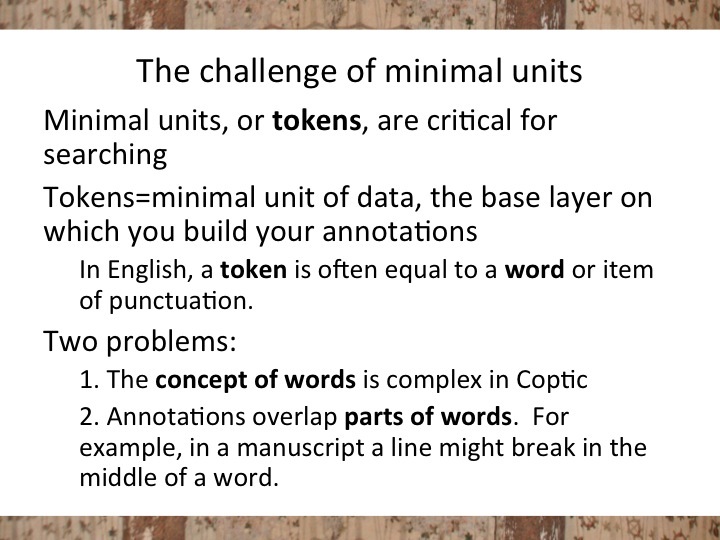 Texts must be must be reconstructed from pieces of manuscripts published in fragments and/or stored in various libraries and museums worldwide. 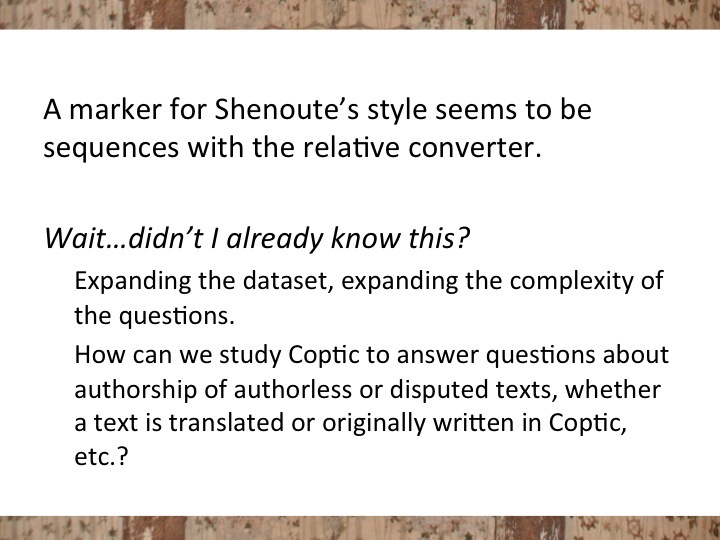 The status of Coptic literary and monastic complicates metadata management and corpus architecture: what constitutes a “work” – the codex in which a copy of the text appeared (and which may be dispersed across multiple physical repositories)? the manuscript fragment housed in a particular library or museum repository or the work, which only might survive in fragments of multiple codices (all copies of a “book” from the monastery’s library), and thus in fragments not only from more than one codex but also more than one modern repository? Coptic scholarship still lacks many standards for digital publication and language research that are taken for granted in Greek and Latin. As with other ancient languages, Coptic manuscripts are written without spaces. However, in contrast to its ancient counterparts, scholarly conventions on word division differ substantially from scholar to scholar. 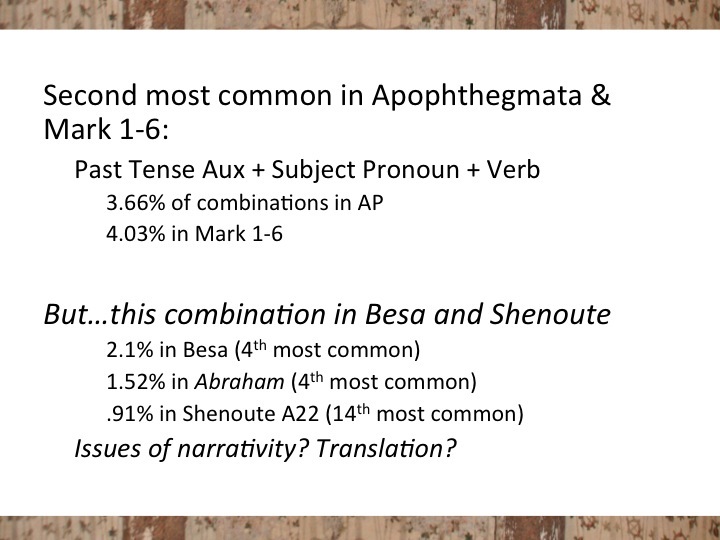 Additionally, since Coptic is an agglutinative language, the relevant unit for linguistic analysis is the morpheme, below the ‘word’ level. This means that segmentation guidelines must be developed for both levels of resolution. 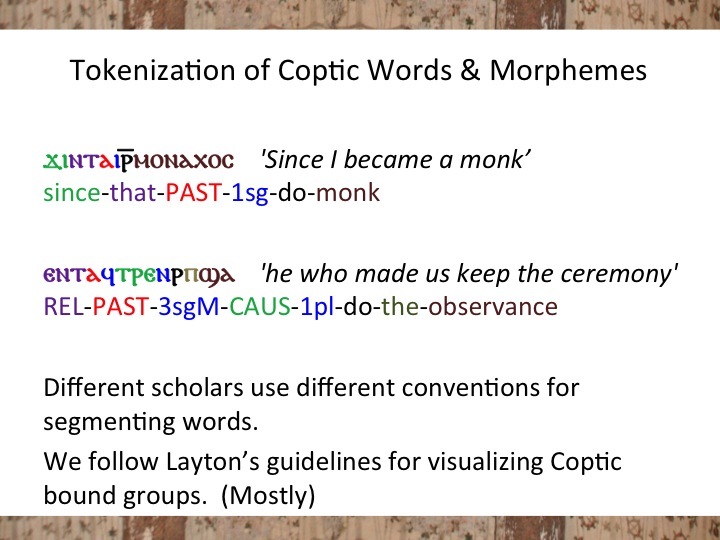 In order to search multiple texts, guidelines and tools for normalization, part-of-speech tagging and lemmatization of Coptic must be developed. These tools need to take into account Coptic’s agglutinative nature, e.g. 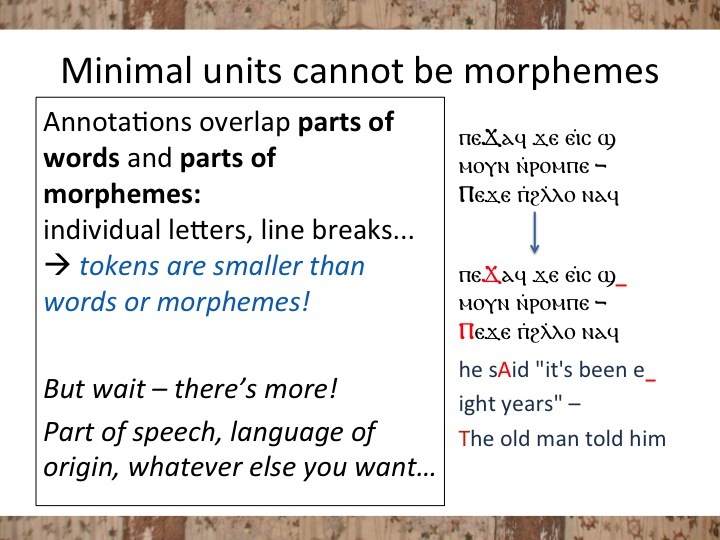 normalizing and annotating on the morpheme and word levels. Finally, the development of the Coptic language during Egypt’s Greco-Roman era raises questions about the origins of the language, its usage in a multilingual context, and the language practices of its ancient speakers and writers. Coptic consists of Egyptian grammar, vocabulary, and syntax written primarily in the Greek alphabet; some Egyptian letters were retained, and some Greek and Latin vocabulary was incorporated into the language. The richness of the vocabulary’s languages of origin varies from author to author, genre to genre. And despite recent publications on the topic, much research remains to be conducted on the extent and nature of multilingualism in late antique Egypt, especially during the fourth and fifth centuries. Additionally, due to the agglutinative nature of the language, one word can be comprised of morphemes with different languages of origin. 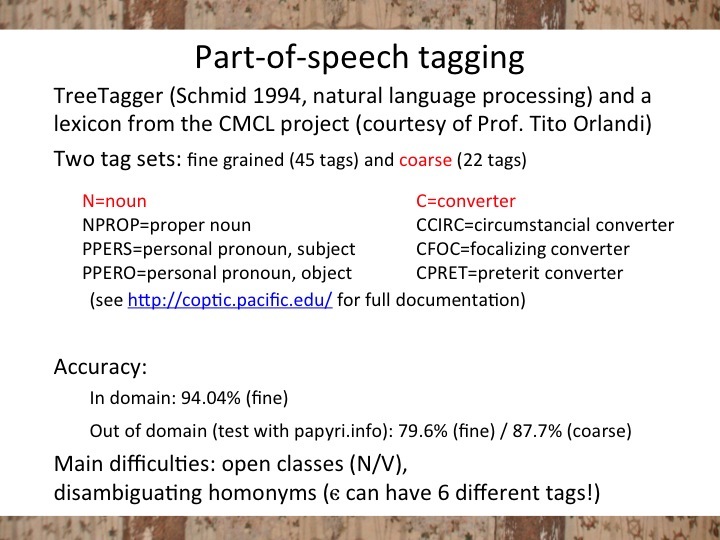 This paper will focus on the automated tools our project is developing to process the language, especially tokenizing and part-of-speech annotations. 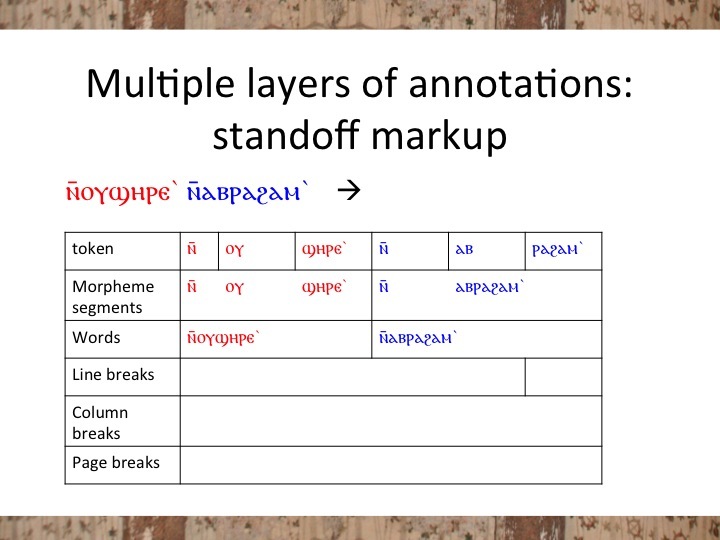 Coptic SCRIPTORIUM has developed the first tokenizer and part-of-speech tagger for the language, and in fact for any language in the Egyptian language family. 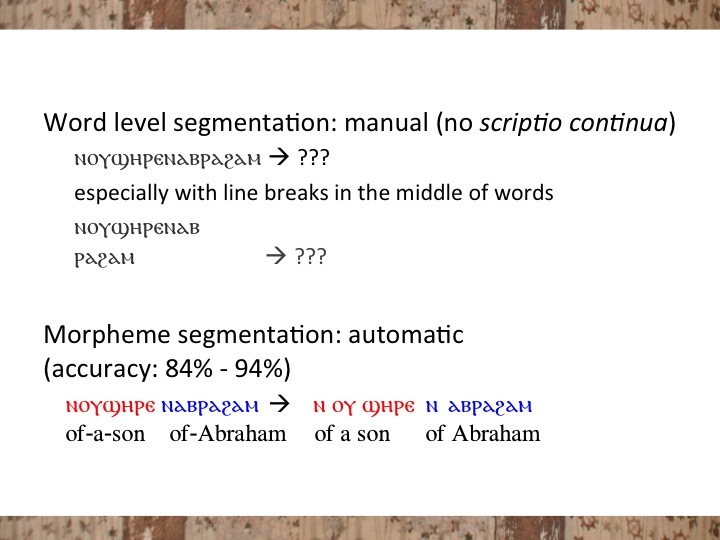 The presentation will address the unique challenges to processing and annotating the Coptic language. We will present our current technical solutions, their accuracy rates, and the potential for future research. 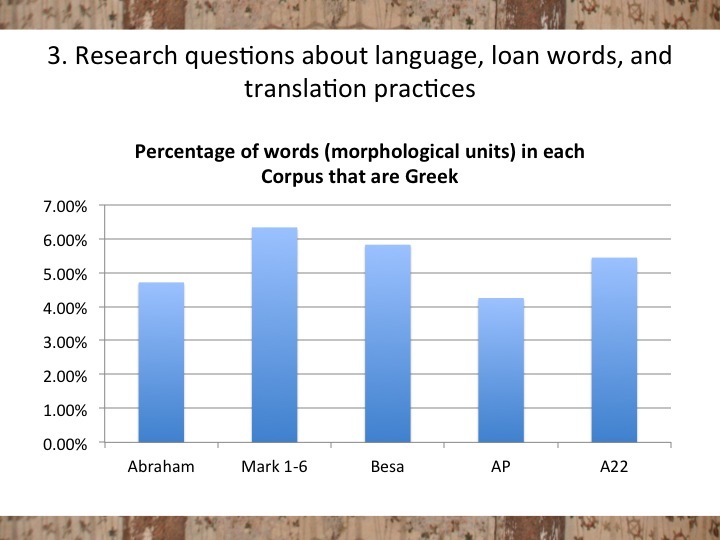 We will also address the ways in which this language’s and corpus’s unique featured differentiate them from other more widely studied ancient languages, such as Greek and Latin. 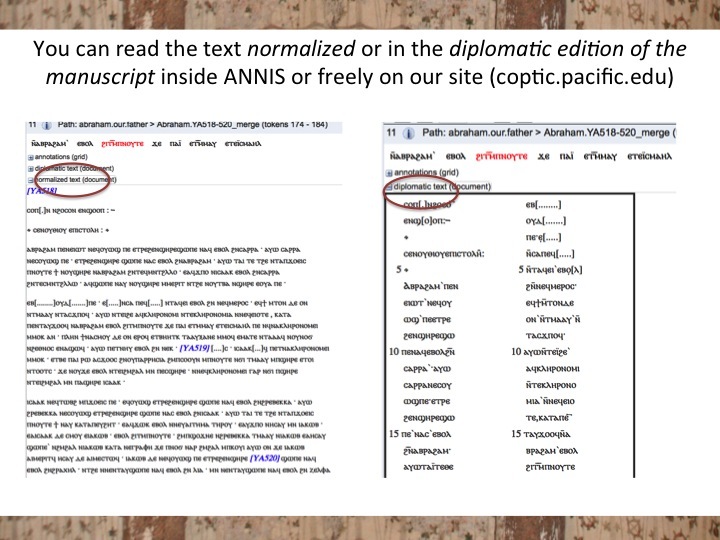 Examples will be drawn from the open-access corpora we are developing and annotating with these tools, available at http://coptic.pacific.edu (backup sitehttp://www.carrieschroeder.com/scriptorium). 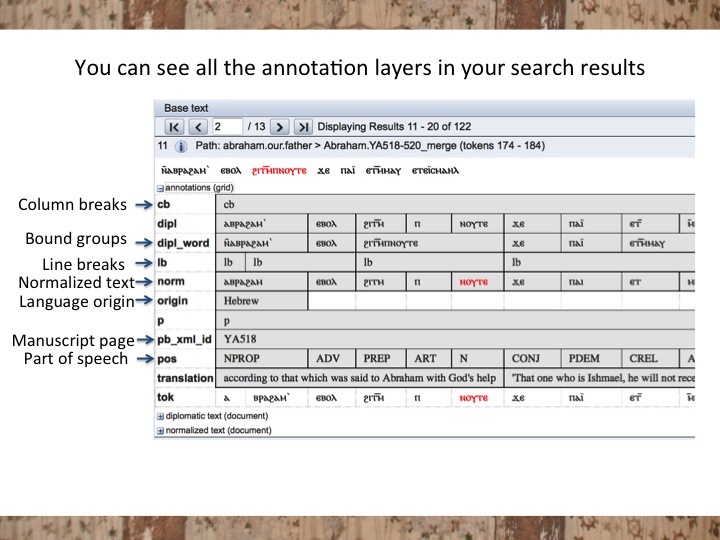 The Coptic corpora processed and annotated with these tools can be searched and visualized in ANNIS, a tool for multi-layer annotated corpora. 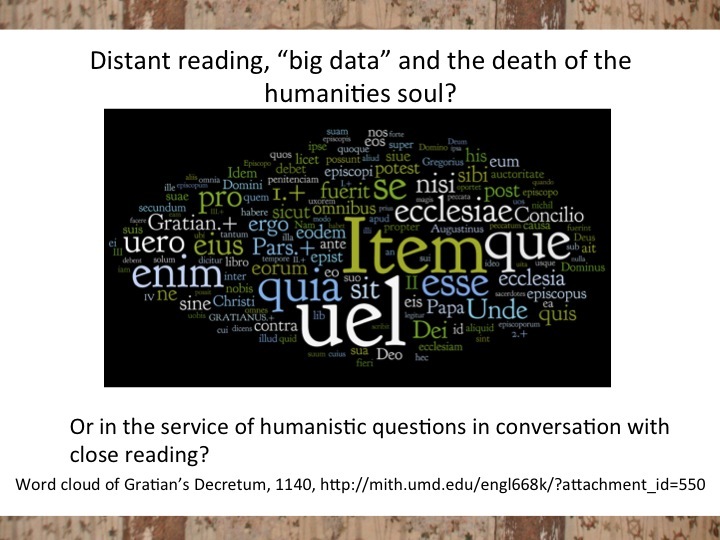 We anticipate this presentation to be of interest to scholars in digital humanities working with ancient languages and manuscript corpora as well as DH linguists and corpus linguists. Bentley Layton, A Coptic Grammar, 3rd Edition, Rev, Porta Linguarum Orientalium Neue Serie 20 (Wiesbaden: Harrassowitz, 2011), 19–20. J. N. Adams, Mark Janse, and Simon Swain, Bilingualism in Ancient Society (Oxford: Oxford University Press, 2002); Arietta Papaconstantinou, ed., The Multilingual Experience in Egypt from the Ptolemies to the Abassids (Burlington: Ashgate, 2010). 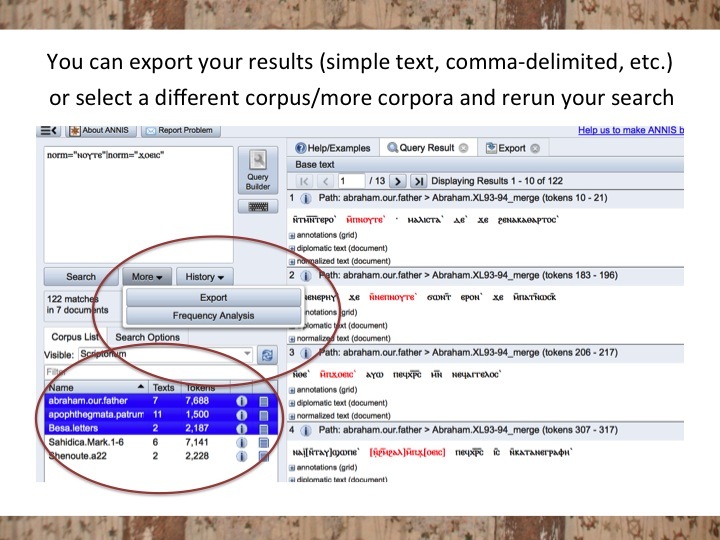 Coptic SCRIPTORIUM is pleased to announce a new release of data and an update on our project. Please visit our site at coptic.pacific.edu (backup at www.carrieschroeder.com/scriptorium). We would love to hear from you if you use our site; we think it will be useful for people teaching Coptic as well as conducting research. Please email either of us feedback directly. 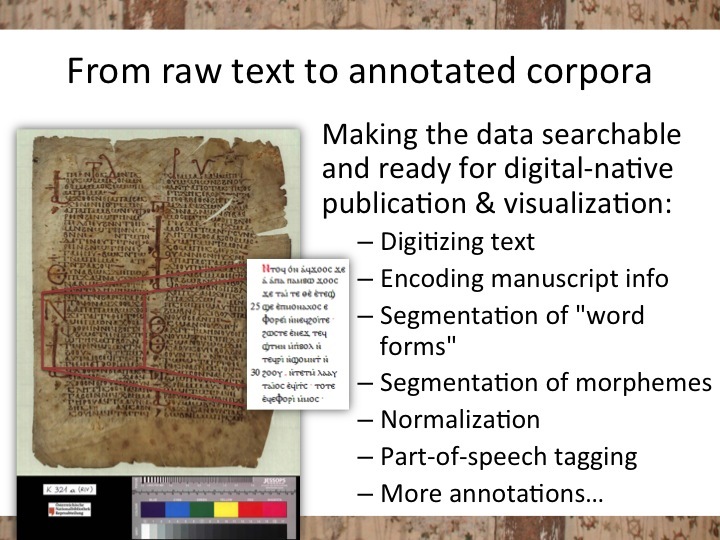 The improvements in automation also mean we would love to work with you if you have digitized Coptic texts that you would like to be able to search or annotate, if there are texts you would like to digitize, or if you would like to annotate existing texts in our corpus in new ways. We are ready to scale up! Thanks for all of your support. This project is designed for the use of the entire Coptological community, as well as folks in Linguistics, Classics, and related fields.